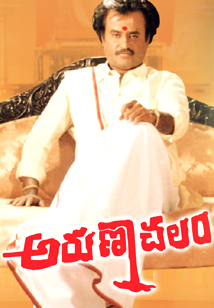 Arunachalam Telugu Movie. Arunachalam is a 1997 Telugu Family drama film starring Rajnikanth, Soundarya, Rambha directed by Sundar C and written by Crazy Mohan. Arunachalam Full Movie Online with HD Quality. Arunachalam Full Movie Description : Arunachalam is a story about a village hero (Rajnikanth) who has 2 brothers and a sister and a happy family. Ravichandran and K.R.Vatsala are his parents. "Vedavalli" (Soundharya) is the daughter of Jaisankar and 'Venniraadai' Nirmala. Nirmala is Ravichandran's sister and they all come to Ravichandran's home for Rajni's sister's wedding. That gives the opportunity for Soundharya and Rajnikanth to fight first, then to kiss and fall in love with each other. By the time the movie interval has come, Rajnikanth finds himself to be an orphan. He leaves his village and heads to Hyderabad where he meets Janakaraj, who gives him a job. By some magical situation, Rajni discovers himself to be a son of a dead millionaire—through Visu. Visu is the guardian of Rajni's father's trust. If Rajni wants his inheritance, he has to follow certain rules. He can get an inheritance of 3000 crore if he can spend 30 crore in a month. The three conditions are: no contributions to charities, not to own any assets at the end of the month, and, above all, no one else must know. If Rajni fails to spend the money according to the rules, all the money will go to his father's trust which is managed by V.K.Ramasamy, "Nizhalgal" Ravi, Kitty and Raghuvaran. These four form a team of "villains". They want to spoil Rajni's efforts and get all the money for the trust and then to loot the money. Rambha is Visu's daughter and she is appointed as the accountant for Rajni for 30 days.